First Floor Main Entrance (PT with respect to the other Street) used as a HOUSE: entrance hall, kitchen, laundry, large living room, 2 toilets and 3 bedrooms. 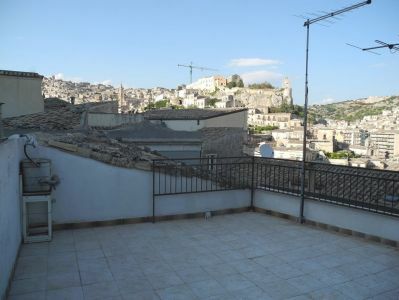 MANSARDA floor with WC, 2 attics used as storage and a spacious useful room from which you access a large terrace overlooking MODICA. The building is a few hundred meters from the CORSO UMBERTO and the main monuments and can also be reached in motion and with a small car. It is close to the "Convent of Santa Anna" which overlooks the City of Modica; Today it is the seat of the State Archives and the "Ente Liceo Convitto" Foundation, promoter of events of different nature. In the district Cartellone and SS. Salvatore, many properties have been renovated for some time now, even for small accommodation facilities.